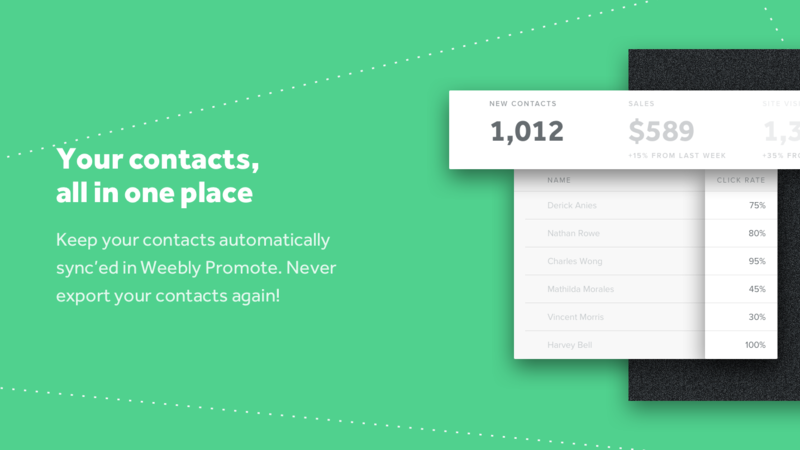 Promote Forms - Add lead capture forms to your website. Convert your site visitors into customers! 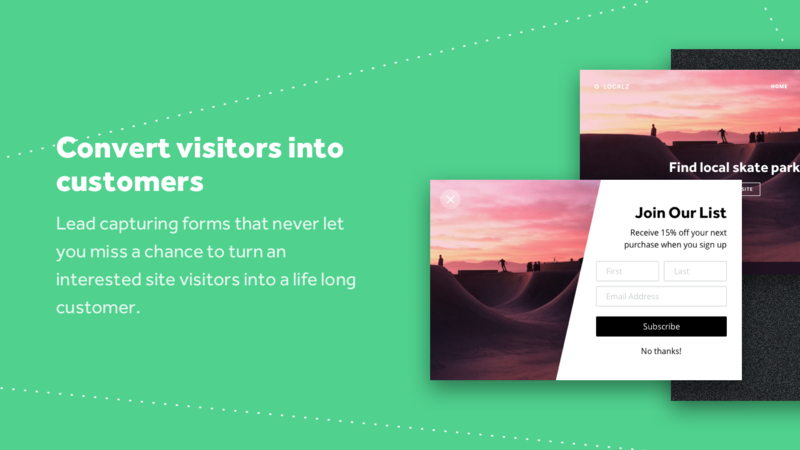 Lead capturing forms ensure you never miss another chance to convert a site visitor into a lifelong customer. 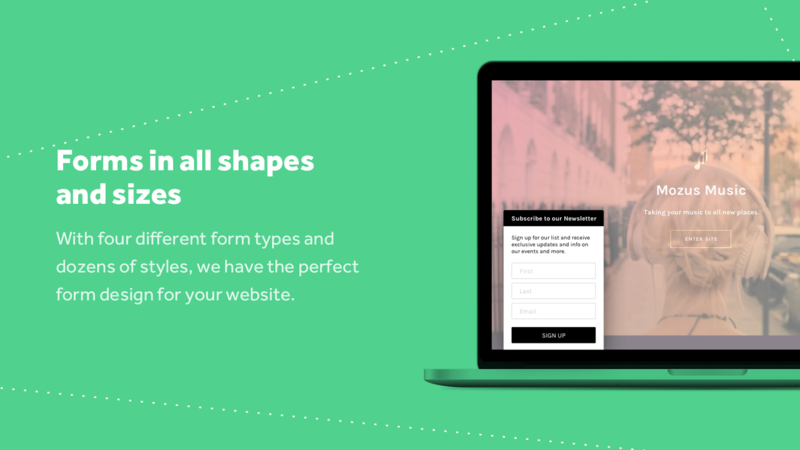 With multiple form designs, styles, and display rules, you are guaranteed to increase your subscriber base using just your normal website traffic! Lead Capturing forms are included in all Weebly Promote plans, so signup today, connect your form straight to your website, and start collecting leads right in Promote. Promote Forms are included in each Weebly Promote Plan. By purchasing Weebly Promote, you will have access to the marketing tools needed to grow your business and build a loyal customer base. The popup form is a classic way to convert your website visitors into email subscribers. 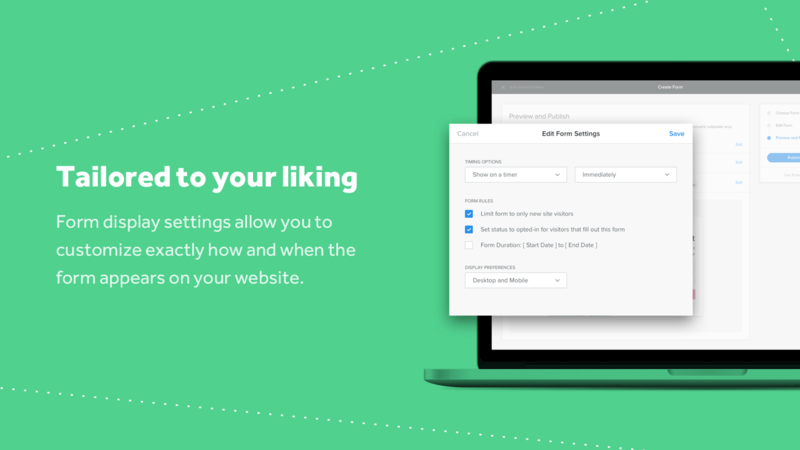 The Smart Bar form anchors to the top of your website and encourage your visitors to sign up for your email updates. The Welcome Mat is a full screen call to action that really works! Convert more of your visitors into subscribers than ever before. It's average, but decent. What I don't understand is that it offers 2 free emails with the free option, under email campaign. Is that 2 free email MONTHLY? or after 2 free emails, you have to upgrade to continue using the app??? It barely ever appears on my website, even though it is all set up. Love the new coupon feature! Been waiting for this and am so excited to be able to add a coupon to my popup form now! Great app though works really well with my Weebly site and love that everything is synced with my email marketing. Good job guys! I love this app. You can fully customize the style of the form (we used our brand logo for the background) and there is a way to automatically send welcome emails or coupons to people that fill out the form. It seems like the team behind this one is often adding new features to it as well. This has been an absolute win for us and has helped our company acquire hundreds of new contacts. We love Promote! I'm not sure if this even works for my website. When I try to view my lead capture form a second time, it does not work. Any help from the developers would be appreciated. We'd be glad to lend a hand! Can you tell us more about where you're encountering the issue? Great app for both my business site and my personal blog site however it looses function when trying to input details via mobile. Have had a lot of customers saying they have tried to subscribe there email yet the form isn't working as it simply disappears from view on screen! If this could be fixed then that would be perfect for both sites and if done I'd recommend to anyone! Hello Gary! It's good to hear the app has been working well for you so far. There definitely shouldn't be any issues with mobile user input. If possible, please get in touch with our support team here so we can sort that out for you! Unreliable. Every time I log in to check anything on the site, I lose functionality of the app. Hello! Our apologies for the issues you've encountered. If you're able to go into more detail on them, please let us know, so our team here can get to work clearing them up.